The links between Scotland and America stretch back over three centuries. Perhaps one can officially date them from 1650, when a group of Scots gathered in Boston to create the first Scots’ Charitable Society, an organization to aid fellow immigrants who had fallen upon hard times. Scottish migration to the British North American Colonies during the seventeenth century remained sporadic, but from the early eighteenth century forward, extended bands of Highland and Lowland Scots settled all through Nova Scotia, New Jersey, Pennsylvania, and North Carolina. Simultaneously, wave after wave of Scotch Irish migrants from Ulster landed in Philadelphia, making their way down the Appalachian valleys into Virginia and beyond. Contemporaries were well aware of this Scots and Scotch Irish migration to the Colonies. As James Logan, chief advisor to Pennsylvania proprietor William Penn once observed: "It looks as if Ireland [i.e., Ulster] is to send all her habitants hither; for last week not less than six ships arrived, and every day two or three are coming." These Presbyterians, the Quaker Logan continued, were "audacious and disorderly"; they were "troublesome settlers to the government, and hard neighbors to the Indians." Since the Scots were often educated, planters in the Chesapeake region frequently hired them as tutors, although they groused at having their children acquire a Scottish accent. The Journal kept by Lerwick émigré John Harrower, who served a four-year indenture as a schoolmaster in Virginia, illuminates this world. At William and Mary, young Thomas Jefferson fell under the sway of Aberdonian William Small, to whom he was ever grateful. When the American Revolution broke out, at least in the Scotch-Irish version of the story, the Ulster natives leaped at the opportunity to attack the British crown. "Call this war by whatever name you may. . . ," observed one Hessian officer, "it is nothing more or less than a Scotch Irish Presbyterian rebellion." King George allegedly called the conflict "a Presbyterian war," and another official stated that cousin "America has run off with the Presbyterian parson." In spite of these comments, the actual Scotch-Irish population was a bit more divided in their loyalties than legend would have it, especially in the South. Still, the Scotch-Irish generally emerged from the Revolution with an enhanced local reputation. The same could not be said for the Scots proper. Although famed poet Robert Burns once wrote an "Ode for General Washington’s Birthday," the Scots who had emigrated to Colonial America were seldom convinced by the patriots’ arguments. Many had fought against the Crown only thirty years previously, but when the Revolution broke out, the majority of Scots sided with Great Britain. Of this there is little dispute. In 1776 former Paisley cleric John Witherspoon, then president of the College of New Jersey and a staunch patriot, tried to change this point of view. He gave an address (later printed as a pamphlet) to the "Natives of Scotland residing in America" that noted: "It has given me no little uneasiness to hear the word Scotch used as a term of reproach in the American controversy." Virginian Thomas Jefferson included a condemnation of "Scotch and other foreign mercenaries" in an early draft of the Declaration of Independence, a phrase that Witherspoon discreetly helped remove. However, Jefferson continued to rail at the "Scotch Tories" for over two decades. During the era of the Revolution, Americans often denounced the Scots. In his 1776 play, The Patriots, Virginia author Robert Mumford named characters "M’Flint," "M’Gripe," and "M’Squeeze." Local pressure either evicted Scots from certain regions (such as the Chesapeake) or forced them to return to Scotland on their own. Flora MacDonald, Scotland’s most famous heroine, left North Carolina for her native South Uist under these circumstances. Perhaps as many as five thousand Scots Tories later migrated to Canada due to their loyalty to the British crown. In the process they became the spiritual founders of Canada. In 1782 the lower house of Georgia passed a resolution declaring that the people of Scotland possessed "a decided inimicality to the Civil Liberties of America." Any Scot found in the region after three days would be "committed to Gaol." But citizens of the new Republic had short memories and this antagonism quickly passed. Paisley-born naturalist Alexander Wilson observed that he received great cooperation on his southward journey from Philadelphia to gather material for his famed American Ornithology (1807—18). An 1810 traveler to Charleston also noted that the ruling Tory aristocracy of South Carolina consisted of "chiefly Scotchmen." After the Peace of Paris in 1783, one finds little criticism of Scottish people. From c. 1790 to c. 1860 the Scots and Scotch-Irish immigrants generally split their destinations between Canada and the new American republic. Figures are, unfortunately, inexact, but the majority probably sailed for Montreal and Ontario rather than Philadelphia or New York. Even so, a small but significant number found their way to the various "British colonies" established in Illinois, Iowa, Kansas, and elsewhere. When the American Civil War broke out in 1861, many a Confederate soldier bore a Scotch-Irish surname. On the other side, Chicago and New York each raised a Scottish-American regiment that fought for the Union. New York’s 79th, which modeled its uniforms after the famed Black Watch, remains the most celebrated of these Scots Union military contingents. In 1893 the city of Edinburgh erected a statue of President Abraham Lincoln in the Old Calton Hill Burial Ground, the first Lincoln statue outside the United States. In an impressive ceremony the provost of Edinburgh and the American consul dedicated the ground as a burial place for five Scots soldiers who had died fighting for the Northern cause. By the middle of the nineteenth century a number of Scots had risen to prominence in American life. By the 1840s Aberdonian George Smith had become the most famous banker of the upper Midwest. Indeed, "George Smith’s money," as it was termed, often proved more sound than state or federal currency. When Smith died in 1899, he left a fortune that approached one hundred million dollars. Fellow Aberdonian Alexander Mitchell, once termed "the best known Scot in Milwaukee," also gained wealth as a banker and, later, served two terms in Congress. Clydeside emigré John Stewart Kennedy played a crucial role in financing the western railroad boom, especially the Northern Pacific line. A native of Glasgow, Allan Pinkerton rose to prominence during the Civil War as a purveyor of information (much of it wrong) to Abraham Lincoln; his name is still virtually synonymous with "detective agency." Other successes included Michael Donahoe, who established the largest foundry in Iowa, and Davis Nicholson and Dugald Crawford, who became prominent mercantile figures in St. Louis. In 1923 Robert Dollar from Falkirk inaugurated the first "round the world" passenger service. Undoubtedly, the most prominent nineteenth-century Scoto American was Andrew Carnegie, the son of a Dunfermline weaver who ended his career as "the richest man in the world." 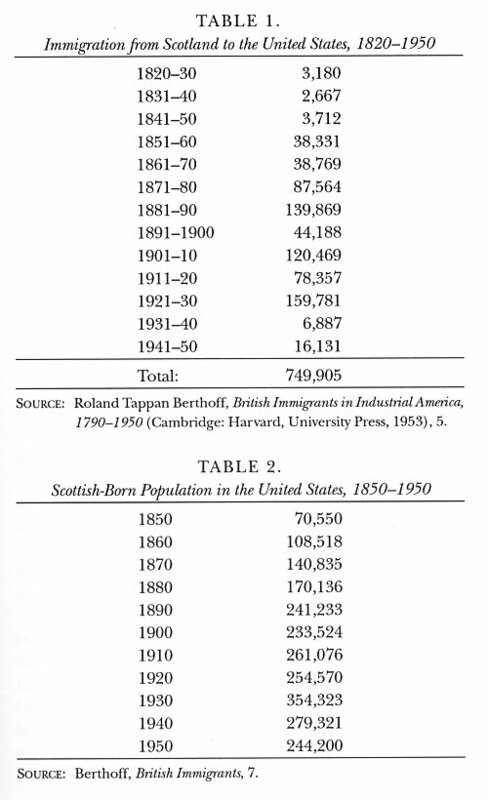 Most Scots and Scotch-Irish immigrants, one may safely say, did not do quite that well. But nineteenth-century America had great need of miners, granite workers, cattlemen, maids, shepherds, bankers, farmers, and missionaries. Because of their history, the Scots possessed long experience with all those occupations. If the average Scots immigrant never quite equaled Carnegie’s success, neither did he or she appear with regularity on the nineteenth-century welfare rolls. American historians did not pay much attention to these Scoto-American links until the late nineteenth century. Then, faced with the arrival of thousands of immigrants from southern and eastern Europe, people of Scots or Scotch-Irish descent began vigorously to champion the role that their ancestors had played in "creating the American republic." Second and third-generation historians wrote scores of books and articles with the contributions of the Scots or Scotch-Irish as their central theme. From the Philadelphia Centennial of 1876 forward, these filiopietistic studies appeared with regularity, bearing titles such as Presbyterians and the Revolution (1876); Scotch and Irish Seeds in American Soil (1879); The Scotch-Irish in America (1896); and The Scotch-Irish in America (1906). Turn-of-the-century popular magazines often struck the same chord. In "The Sons of Old Scotland in America" (1906) Herbert N. Casson proudly listed the most prominent Scoto Americans of his day: California congressman James McLachlan; House speaker David Henderson; Buffalo, New York, mayor James N. Adam; New Hampshire governor John McLane; secretary of agriculture James Wilson; noted inventor Alexander Graham Bell; cleric George Gordon of Boston’s Old South Church; educators William Kaller and John Kennedy; naturalist John Muir; industrialist Andrew Carnegie; and so on. "A remarkable record and a remarkable race," he concluded. The Scotch-Irish patriotic groups went even further. In 1889 they inaugurated an annual series of conferences to extol the virtues of "the race," and they faithfully did so for over a decade. Declaring their absolute neutrality on all political or religious issues, these regional and national Scotch-Irish societies declared their purpose solely "to impress upon the pages of history the heroic deeds of the sons of the Scotch-Irish race." Scottish men, incidentally, were not welcome unless they had married Scotch Irish wives. When the collected speeches of the conferences were published, they contained few surprises. Appeals to Scottish history—which the Scotch-Irish equally claimed as theirs— extolled the virtues of William Wallace, Robert the Bruce, Sir Walter Scott, and Robert Burns. One speaker in 1891 declared that the synonym for the Scotch-Irish "race" lay in the phrases "national freedom, general education, and sound scriptural faith." Such celebrations of ancestral ties formed an integral part of white middle-class fin de siècle life. It was during this era that most city libraries established genealogical divisions, and the figure of the professional genealogist became a familiar one in the nation’s archives. When Scottish women formed their own ethnic organization, the Daughters of Scotia, in 1898, they reflected the same concerns that animated the national Daughters of the American Revolution (formed in 1890) and the regional United Daughters of the Confederacy (formed in 1894). By the turn of the century Caledonian societies, Burns clubs, and St. Andrew’s societies had so proliferated that hardly any American or Canadian city of size lacked one. One author claimed that there were more Scottish-American organizations than their Welsh-, Irish-, or English-American counterparts. All these organizations helped trumpet "Scottish contributions" to the formation of both the American nation and Canada. The articles, speeches, and books on this theme naturally varied in quality. Henry Jones Ford’s The Scotch-Irish in America (1915) probably represented the genre at its best. A professor of politics at Princeton, a university that had long prided itself on strong Scottish-American links, Ford detailed the impact that the Scotch-Irish "race" had on America with considerable perception. He acknowledged strengths and weaknesses in the interaction. But George Fraser Black’s Scotland’s Mark of America (1921) is far more representative of this variety of work. Although Black admitted at the onset that the task of "positively identifying certain individuals as of Scottish origin or descent [was] a very difficult one," he proceeded to do just that, in thirty chapters, compiling a lengthy list of Scottish men (no women) who had served in the presidency, vice presidency, senate, house of representatives, and judiciary. In addition, he listed those who had been ambassadors, state governors, military men, scientists, industrialists, bankers, journalists, and so forth). Carefully distinguishing between the Irish, Scots, and Scotch-Irish, he argued for the continuous and formative influence of ancestors down to the nth generation. Black’s volume ranks as the epitome of "Scot counting," the most prevalent form of late-nineteenth, early twentieth-century Scottish-American historiography. Perhaps this is the best place to deal with the question of numbers. Historians estimate that as many as 2.33 million Scots left Britain between 1825 and 1938. The Scots were statistically more likely to emigrate than any other European people, excluding only the Irish and the Norwegians. During the mid-nineteenth century the main flow seems to have come from Scotland’s rural Lowlands, due largely to the industrialization of the region. The typical Lowland emigrant moved first from farm to town and then, ultimately, overseas. In general the Lowlanders seem to have emigrated as individuals or in small family groups, while the Highlanders usually traveled later, more sporadically, and en masse, often seeking to duplicate their peasant communities in another part of the world. Most of the emigrants came to North America, although during the American Civil War (1861—65) and various depressions they tended to go to Australia and New Zealand. As one can see from Berthoff's tables, these are not extensive figures. But numbers alone can be misleading. Although the Scots were by no stretch of the imagination a large American immigrant group, they, like the Jews, Hungarians, Greeks, Unitarians, Quakers, and Episcopalians, had an impact that often extended far beyond their numbers. Their presence proved especially significant in the more sparsely populated West, where virtually every individual counted because there were so few of them. Moreover, the impact proved long lasting. The 1990 census listing of Americans of Scottish ancestry shows that the majority still reside in the various western States. One could perhaps date the arrival of a new historical sophistication in Scottish-American historiography to Thomas Jefferson Wertenbaker’s March 8, 1945, lecture to the University of Glasgow, "Early Scotch Contributions to the United States." A professor at the University of Virginia, Wertenbaker moved far beyond the mere listing of names and totting up of contributions. His analysis of Reverend James Blair, Governor Alexander Spotswood, and Governor Robert Dinwiddie highlighted Scotland’s cultural impact on American Colonial life. In passing, Wertenbaker noted that Glasgow tobacco factors had dominated the early Chesapeake tobacco trade and that the religious revival of eighteenth-century Scotland had crossed the Atlantic to produce a number of American colleges and secondary schools. Finally, Wertenbaker argued that after c. 1700 the Scotch-Irish "more than any other group, created the first western frontier." Nine years later, the William and Mary Quarterly devoted its entire April 1954 issue to links between Scotland and America. All the articles were of high calibre, but John Clive and Bernard Bailyn’s "England’s Cultural Provinces: Scotland and America" has become a classic. Clive and Bailyn argued that Scots and Colonial Americans both felt themselves on the edge of a sophisticated, cultured world centered primarily in London. Consequently, each nation developed a parallel sense of "cultural inferiority" regarding its native traditions. But then the stories diverge. The success of the American Revolution in 1783 allowed the United States to celebrate its distinctive cultural traditions and, eventually, to flaunt them in English faces. But the failure of the Stuart uprising in 1746 forced Scotland to consider its native traditions through a saddened, more "romantic" lens. Consequently, a shared sense of cultural inferiority, combined with sullen resentment against the English, persisted for generations in American and Scottish cultures. With T. J. Wertenbaker and the 1954 William and Mary Quarterly, a new era of Scottish-American historiography had begun. On the Scottish side, the foremost scholar was Professor George Shepperson of the University of Edinburgh. Over many years, Shepperson published a series of articles on Scottish-American links in the eighteenth and nineteenth centuries. He especially focused on connections between Scots and Americans during the Revolutionary era and in the abolitionist movement. Until his retirement from the University of Edinburgh, Shepperson also directed a number of Scottish-American dissertations, including two excellent ones: Robert Botsford on Scotland and the American Civil War and Helen Finnie on Scotland and Reconstruction. Shepperson’s friendly rival at Glasgow University, Bernard Aspinwall, concentrated on the impact of the Clyde Estuary on American life. He has also written on the transferable nature of Scottish religious identity. Thus, from the 1950s forward, scholars began to explore the links between the two cultures in a variety of areas. In 1956 Ian Graham analyzed the impact of Scottish immigration on North America up to the close of the American Revolution. He concluded that from 1768 to 1780 about twenty-five thousand Scots—mostly from the Highlands—had left the British Isles to settle in western Pennsylvania and North Carolina. In 1971 Douglas Sloan’s The Scottish Enlightenment and the American College Ideal argued for the central role that the Scottish universities had played in forging the American educational system. The largely Presbyterian Scots, he maintained, had never feared an educated populace as had the leaders of Anglican England. Thus, Scots were far more congenial to the idea of mass education. If American education has British roots, Sloan argued, they rested in Scotland, not in England. Four years later, University of Edinburgh professor Andrew Hook’s important Scotland and America: A Study of Cultural Relations, 1750—1835 explored early literary links. Hook emphasized the impact of writers Jane Porter, Sir Walter Scott, and the essayists in The Edinburgh Review on early American belles lettres. He also argued that most nineteenth-century Americans viewed Scotland through a double lens: those of "the land of Rationalism" and "the land of Romance." His central thesis remains unchallenged. Specialists in eastern Colonial America have long acknowledged a prominent Scots connection in North Carolina, New Jersey, and the Chesapeake. In The Highland Scots of North Carolina (1961), Duane Meyer sketched part of this story. Both Thomas M. Devine and Jacob M. Price have written on the crucial Scots-Chesapeake tobacco connections before the Revolution. Ian C. Graham, Wilbur Shepperson, Charlotte Erickson, and David Dobson have done the same for the theme of immigration. In 1978 sociologist William C. Lehmann expanded Scottish influence to virtually every area of Colonial life with his Scottish and Scotch-Irish Contributions to Early American Life and Culture. In 1980 Charles H. Haws published his monograph, Scots in the Old Dominion, 1685—1800, while Ned Landsman added his Scotland and Its First American Colony, 1683—1760 five years later. The recent study by Alan L. Karras, Sojourners in the Sun (1992), treats the Scots in Jamaica and the Chesapeake region. During the last fifteen years, the literature has steadily expanded. While most historians have assumed that the Great Awakening of mid-eighteenth-century America had uniquely Colonial origins, Marilyn Westerkamp and Leigh Eric Schmidt have convincingly argued that these Colonial revivals trace their origins to Scots and Ulster Scots festival communion services. Westerkamp even suggests that revivalism in general was simply part of a Scotch-Irish religiosity that found a fertile field in America. The links between the Scottish and American Enlightenments have also attracted considerable attention. Scots historian Archie Turnbull has suggested that Scotland’s Declaration of Arbroath (1320) formed the "model" for Thomas Jefferson’s Declaration of Independence (1776). Similarly, George Shepperson has argued that the writings of William Duncan, Professor of Natural Philosophy at Marischal College, Aberdeen, and author of Elementc of Logick, may have contributed to the phrasing of the Declaration of Independence by his use of the term self evident. The boldest statement along these lines came from Garry Wills’s Inventing America (1978), which suggested that Jefferson owed more to Scottish thinkers such as Thomas Reid than he did to English essayist John Locke. The essays in Scotus Amencanus: A Survey of the Sources forLinks between Scotland and America in the Eighteenth Century (1982) and Scotland and America in the Age of Enlightenment (1980) explore in detail the numerous theological, political, economic, medical, educational, and evangelical debts that Colonial America owed to Scotland. If a historian includes folkways culture, and music in the list, he or she could almost argue that the Scots and Scotch-Irish had more influence on molding early American institutions and lifeways than any other European group, not excluding the English, Irish, Dutch, Swiss, Germans, French, or Spanish. The pervasive impact of Scotland upon America continues to fascinate up to the present day. In 1976, the American bicentennial yeas, Old Dominion University in Norfolk, Virginia, established an institute of Scottish Studies. Their scholarly journal, Scotia, dedicated to exploring such links, first appeared in 1977. Similarly, James McLeod began a program in Scottish Studies at the College of Northern Idaho in Coeur d’ Alene, an area of the state that boasted numerous Scottish settlers. Most of the renewed interest in Scottish-American scholarship, however, has concentrated on the seventeenth and eighteenth centuries. Indeed, the brunt of the American documents held by the Scottish Record Office in Edinburgh falls into that time frame. But, led by C. Duncan Rice’s study of Scots abolitionists, a few scholars have attempted to carry the story into the Victorian era. By far the most controversial analyses have come from southern historians Forrest McDonald, Ellen Shapiro McDonald, and Grady McWhiney. They have combined forces in a number of articles (and McWhiney has gone solo in Cracker Culture ) to suggest that a pervasive "Celtic" (very broadly defined) influence has been the central feature in shaping southern life. Although Roland Berthoff denounced the descent of a "Celtic mist" over southern history, the McDonalds and McWhiney have had the best of the argument to date. Even skeptics have acknowledged the persistence of Scotch-Irish cultural traits and physiognomy on the southern frontier, a theme explored in detail by Ulster folklorist E. Estyn Evans and Ulster television producer Rory Fitzpatrick. The Museum of American Frontier Culture near Taunton, Virginia, also makes this a central theme of its exhibits. In 1989 historian David Hackett Fischer joined their campaign with his section in Albion‘s Seed on the links between the English/Scottish Borders region and the American frontier. From farming practices to frontier folklore, from mournful Appalachian ballads to the "rebel yell," these historians argue, the Scots/Scotch-Irish/Celtic influence lay just below the surface of antebellum southern society. After all, Margaret Mitchell did name her heroine in Gone with the Wind "Scarlett O’Hara." Except for these studies of the antebellum South, scholars have paid scant attention to the impact of Scots immigration on the rest of nineteenth-century America. After the Revolution, the argument goes, the Scotch-Irish and Scots largely left their communal identity behind. Thus, the Scots and Scotch Irish who moved into the Ohio River Valley and Mississippi Delta in the early nineteenth century lost their distinctive "Scottish" connections. They moved west as "Americans." Since the infamous Highland Clearances of the nineteenth century sent immigration primarily to Australia, Canada, and New Zealand, the American aspect of the Scottish story simply stops. The Scots lost their visibility and disappeared into American life. Historian Charlotte Erickson’s study, Invisible Immigrants, reflects this point of view in title and in argument. Consequently, few historians have explored the Scottish impact on the most extensive region of the American nation: the Trans-Mississippi West. From Ralph Waldo Emerson’s time forward, the nation’s western "frontier" has ever been viewed as the most American section of America. American though it may have been, the Trans-Mississippi West contained a vast array of diverse peoples. American Indians, whose cultures ranged from the buffalo hunters of the northern plains to the settled Pueblo farmers of the Rio Grande Valley to the Apache and Navajo raiders of the Mexican borderlands, claimed the region as their own. About seventy thousand Hispanic farmers in New Mexico and along the Rio Grande corridor suddenly became American citizens with the Treaty of Guadalupe Hidalgo in 1848. In the Great Basin of Utah the Latter-day Saints (Mormons) carved out a religio-cultural enclave that still dominates the region. Later, the Great Plains became home to other ethnic colonies: German Roman Catholics, Mennonites, Hutterites, Jews, Swedish Lutherans, and so on. A diversity of cultures has long characterized western life. So, too, the diversity of the natural world. Americans east of the Mississippi proudly pointed to their natural wonders: Niagara Falls, the Natural Arch of Virginia, the Great Smokey Mountains, the White Mountains, the Valley of the Hudson River, and the Florida Everglades. Impressive though these might be, they paled beside the geography of the Far West. When travelers first enountered the undulating expanse of natural grasses of the Great Plains, they could only compare them to waves of the ocean. When they first crossed the Sierra Nevada Mountains or the Colorado Rockies, they usually likened them to the Italian or Swiss Alps. San Francisco Bay, the Columbia River Gorge, Yosemite, Yellowstone, and Mount Rainier ever challenged their descriptive skills. The American Southwest, with canyons unmatched in any other part of the globe, seemed the most marvelous of all. Sunsets over red-rock mesas fascinated the romantic landscape artists of the era, who tried in vain to capture the moment. The discovery of abandoned Anasazi villages in Chaco Canyon, New Mexico; Canyon de Chelly, Arizona; and Mesa Verde, Colorado, further teased the Euro-American imagination. Who were these people? What had happened to them? The Trans-Mississippi West also abounded with exotic animals and plants. Elk, deer, and antelope roamed the mountains and prairies, while chum and sockeye salmon spawned in the great rivers of the Pacific Northwest. Fur-bearing creatures, such as mink, muskrat, and, especially, beaver, lived alongside every riverbank. Uncounted (uncountable) bison ranged from the Canadian Great Plains southward into New Mexico. The gigantic strands of sequoias, pines, and firs of the Pacific Northwest stood unrivaled outside of Russia. By the time the forty-niners discovered gold in California and, later, silver in Nevada, the Trans-Mississippi West had emerged as a veritable utopia. Even regions that today are deemed of only marginal aesthetic/economic value—such as the vast, empty desert of southeast Oregon/northern Nevada—astounded the initial settlers with their beauty and economic potential. This mixture of beauty and natural abundance of the North American West, in writer Wallace Stegner’s words, catered to "the common man’s dream of something for nothing." The Scots and Scotch-Irish were prominent among these "common men." Although they could claim no familiarity with deserts, those from the Highland regions surely knew the solace of the mountains. Years of involvement with the English, plus the far-flung trade network that reached into the Baltic regions, had attuned Scots merchants to the art of dealing with people from different cultures. One does not have to look far in western history before coming across an émigré from Scotland or Ulster. Still, relatively few historians have explored these connections. There have been studies of British immigration to America in general, sometimes to the West in particular, but they usually mention the Scots only in passing. The two most recent books on the Scottish-American connection, by Orkney journalist Jim Hewitson and Isle of Skye historian James Hunter, do not give much attention to the links between Scotland and the West. Using a strict definition, one can find only five monographs that focus on the Scottish experience in the Trans-Mississippi West: Alexander Campbell McGregor’s Counting Sheep (1982), the story of the McGregor agricultural enterprises of eastern Washington State; W. Turrentine Jackson’s The Enterprising Scot (1968) and W. G. Kerr’s Scottish Capital on the American Credit Frontier (1976), which treat Scottish investment in the American cattle industry; Bruce LeRoy’s Lairds, Bards and Mariners: The Scot in Northwest America (1976); and James Hunter’s saga of the McDonald family and Montana, Scottish Highlanders, Indian Peoples, published in Scotland as Glencoe and the Indians (1996). Similarly, only a few western Scots have been subjects of biographies. May Reed Porter and Odessa Davenport have written on nineteenth-century adventurer Sir William Drummond Stewart in Scotsmen in Buckskin (1963); Susan Bryant Dakin did a study of Hugo Reid, A Scotch Paisano in Old Los Angeles (1978); Leonard Arrington described the career of a Scottish Mormon millionaire in David Eccles (1974); William Norwood wrote on naturalist David Douglas in Traveler in a Vanished Landscape (1973); and Louise Shadduck portrayed Andrew Little, Idaho Sheep King (1990). The only western Scot to receive extensive biographical treatment has been naturalist John Muir. In the pages that follow I will attempt to fill in at least part of this gap. My overall thesis can be stated at the outset. For about 130 years, from c. 1790 to c. 1917, the economic and social conditions in Scotland and Ulster proved especially congruent with those of the American West. The Scots and Scotch-Irish population pressures, the economic dislocations, a heritage of wandering, a long-standing emphasis on formal education, the ancient skills of the drovers, shepherds, gardeners, ministers, miners, and granite carvers, the newly created middle-class investment corporations (which needed places to put their money), the hunting expectations of wealthy Scots lairds, and the foibles of Scots "remittance men" all meshed nicely with the American and Canadian Wests. In addition, the rich tradition of Scottish romance and myth, as seen in the traveling artists, writers, photographers, and entertainers, provided a ready infusion for what would eventually emerge as the new republic’s greatest cultural export: the myth of the American West.